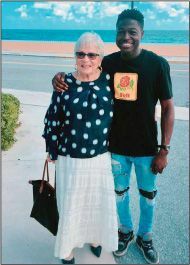 ▪ He’s a 22-year-old black rapper living in Harlem; she’s an 81-year-old white retiree in Florida. Through their shared love of an online word game, the two have struck up an unlikely but powerful friendship. Rosalind Guttman first endeared herself to Spencer Sleyon when she played the word “phat” on the Words With Friends app. “We started chatting through the app,” says Sleyon, “and she became a good friend, someone I could confide in.” Three hundred games later, the pair are closer than ever. Guttman gives Sleyon life advice, and the two recently went for lunch in the octogenarian’s hometown. “She is lovely,” says Sleyon.